Kate Smith was one of radio’s most enduring personalities. 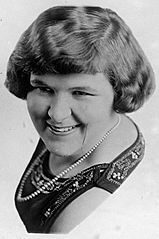 Her first radio program Kate Smith Sings begain airing in 1931. Her last program left the air in August 1958. During her time on the radio, she hosted variety programs, singing programs, and a daily talk show. Her show would provide launching pads for such great stars as the Aldrich Family, Abbott and Costello, and Jackie Gleason. Smith’s signature song was her rendention of God Bless America which she first introduced in 1938. Her beautiful voice and a genial manner makes her one of radio’s must listen to stars. 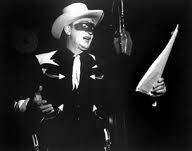 There are few programs that are more associated with the Golden Age of Radio than that of the Lone Ranger. While officially produced as a children’s show, it had and still has many adult fans and Beemer was the best known voice of the Lone Ranger. Before he became the voice of the Lone Ranger, he handled the Ranger’s personal appearances because the then-star Earle Graser didn’t seem to look the part, and he also apparently did some fill-in parts. However, when Graser died, Beemer became radio’s full time Lone Ranger for thirteen years and the vast majority of surving recordings feature Beamer. He was forbidden from taking other acting roles while playing the Lone Ranger.